I’m always thrilled when a group asks me to speak – and I’m also amazed and a little terrified, too. Amazed that the Lord allows me to speak before His women and share His Word and terrified I’ll mess it up. Just a few weeks ago I spoke at First Baptist Church of Trafford– which is just 15 minutes from my HOUSE! Seems I often speak hours or a state or two away, so it was quite a treat to be just down the road. 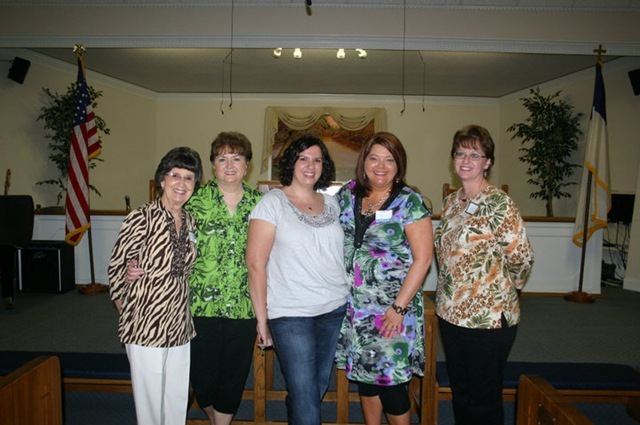 It was a joy to be with this wonderful group of Jesus-loving women! They’d decorated the fellowship hall with a gardening theme and it was wonderful. And it wasn’t just a theme — they’d planted a garden by the church and allowed the community members in need to come and get fresh vegetables — what a wonderful ministry. There was also a feast that would knock your socks off. And the biggest spread of sweets I’ve seen in some time. And to top off the night, my oldest girl, Charity and her friend, Rachel decided to come by. What a powerful passage of scripture and I could teach on it for a month — solid, but I didn’t. I know the ladies of FBC Trafford are happy that I didn’t. There is so much in that one small passage about understanding who we are in Christ — and being rooted and grounded in love. As He does, the Lord allowed this faulty cracked vessel to be used by Him. It was a joy, a blast and a blessing!! Mary, thank you so much for everything you did! Everyone had fun and really enjoyed the message brought to us. I’m glad you had a good time, too. I hope we can do this again sometime soon!!! !